I did not know what to expect when I started blogging back in November 2009. To be honest I started blogging with the intention to make money but didn’t know how. Fortunately the internet is a very informative place. One can learn almost anything from the internet. The trick is not to get information overload. After six months, I finally got to the $100 mark on my Google Adsense account. $100 is the minimum amount required for payout. Not an amount to shout about but it’s a milestone for my make money online journey. In these six months, I found out that contrary to what many online marketeers say, making money online actually requires a lot of hard work and patience. And there is a lot of trial and error on my part. In this post, let’s share what I have done to achieve $100 with Adsense in 6 months. All the sites I use are free. No subscription required. I started this Young Neighbourhood blog on Blogger because it is free. At that time, being new to blogging I did not want to put in any investment on something that I am not familiar with. So Blogger is the obvious choice. Blogger is user friendly and you can set up Adsense easily from here. Due to Blogger’s popularity, you can get a wide range of applications that is compatible. For example, the blogspot templates available are endless. Blogger is highly recommended for new bloggers as you don’t need to delve too much into the technical of setting up a blog. The first month I played around with various blog templates and change the layout of my blog (many times). I posted whatever I felt like posting. Second month… I began to get impatient. There is very little traffic to my blog. So I started reading articles on attracting traffic. Mean while, I still posted whatever I felt like posting. After reading a lot of crap articles, lady luck finally came. In one blog, I was directed to HubPages. I read a lot on blogging and writing articles online here. Information on this site is applicable and useful because they are written by experienced hubbers that have been through the process. I learned about blogging from HubPages and later decided to join this site and publish my own hubs. I started to have a direction. Publishing a hub on HubPages allows you to share 60% Adsense revenue while HubPages will take the balance of 40%. A small price to pay/share. HubPages has Pagerank 6. My Young Neighbourhood blog has only Pagerank 1. The authority of this site allows articles that you published to be quickly indexed by Google. From observation, it takes a day or two for your article to be indexed and to be ranked highly on the searches. I have a few articles in HubPages that is on first page of Google search (depending on the keyword search). This is great for attracting traffic. If you have traffic, more often than not, money will come too. To date I have 18 hubs on HubPages and planning to publish much more. This is where you should focus on… churning out good content articles on HubPages and rely on the site’s authority to get your articles indexed and ranked. Visibility is important. No one will know that an article is good until they read it. To be successful, your blog has to be in a particular market niche. Hence, I started my Healthy Living blog on Blogger. The name says it all – Healthy Living is the market niche and I will blog on this topic only. I started this blog 3 months ago to try out what I have learned. Healthy Living is already generating a bit of Adsense revenue in this trial stage. I have to admit that I am not putting enough time on this blog as I focus on HubPages primarily. Now, these are my 3 faces on the internet. I place Adsense on all 3 sites so when readers/visitors click on the ads I get money. Sounds simple but you really need traffic before the money start flowing. 1) Submit your URL to Google, Yahoo and Bing. Although web crawlers will eventually find your pages, this may take time and submission of URL directly to these search engines will shortened it. Also use Submit Express to submit your URL to 40 other search engines. Make your site visible. You do not need to do this for HubPages as it is done automatically by them. I use all the above sites because they are revenue sharing. 10% of my Adsense earning is from them. Read my previous post on “I am doing more Backlinks” here. 3) Join MyBlogLog and BlogCatalog. Socialize with communities here. You will be able to get decent traffic to your blog on daily basis. This may take a bit of time for your friend base to grow and you need to put effort in leaving comments on their blogs. A useful feature on both sites is, you can broadcast your new blog post or anything else to all your friends in a single click. Imagine if you have 1000 friends and 10% respond to it. Click here for my profile on MyBlogLog. - This site has been has been discontinued. Click here for my profile on BlogCatalog. If you have joined HubPages, socialize with the hubbers. I find them a helpful lot. 4) Use Facebook and Twitter to send traffic to your blog. Share your new blog post on Facebook and tweet it. You can repeat this if respond is poor but do not make it look like spam. My Twitter profile is jasonycc. 5) Use StumbleUpon, Digg, Reddit. So far I have not much luck yet with these sites. The best traffic I had from StumbleUpon is 55 hits on a blog post. Reddit, I once got 28 hits to a blog post. On Digg.. nothing. I am still exploring on how best to use these sites. Now I am gearing up for the next $100. It will take a shorter time to achieve. Six months experience into blogging and I am just on the tip of an iceberg. Hope to share more when I know more. If you noticed, I am still riding on someone else’s website be it Blogger or HubPages. I am thinking of having my own website soon when my monthly Adsense earnings can cover the costs of hosting my own website. Till then, I'll just need to work harder and learn more. Hope this post has been useful and I welcome feedback and questions so that we can all improve in blogging. Good Luck! Nice, I've learned a lot from this article. I hope I would also be able to earn more on backlinks. Glad that this is useful. Do check out the sites listed above on backlinking. Most of them share Adsense revenue. To date I get most Adsense revenue from Xomba and Snipsly. Wow good for you. Google adsense disabled my account after somebody click my adds more than once. I did not tell this person to do it but I was devastated because I paid the price of somebody's wrong doing. I have the proof that this person do it once because she leave a message in my cbox but pretended that she did not know although I post it in my blog. Now she still are doing it and told me to click her ads. I will not do it if it is not necessary. thanks for sharing of this info. analou, I am sorry to hear that. Did you report it to Adsense? This could happen to anybody. There should be a way to curb such wrong doing.. but I don't know how yet. Anyone out there who has the same experience or can advise on this?? As time goes on the money goes up quicker and you will notice more check, congratulations! Thank you Elizabeth... from your words to my adsense account. Hopefully that will come true sooner than later. I have checked out your website and could learn more from you. Glad that you stopped by. Congratulations! I made my first $100 back in April and it's the best feeling in the world! All the best in the future! Luke, you are 2 months ahead of me then and I agree it's a wonderful feeling when you see the fruits of your labour. Thanks for dropping by. All the best to you too! We'll congratulations first to your achievement. Promoting a site is very difficult task but sometimes enjoyable. Just keep it up. Thanks for sharing this. Very useful and informative. Thumbs up for your hard work. Audrey, Jim B... it's my pleasure in sharing this. Thank you for visiting and reading this post. Thank you so much for sharing this with us...!! Movies, Inforhub... thanks for your encouragement. Will continue my make money online journey. Enjoying it! Raja, bujju... thank you for your visit and encouragement. thanks for the tips. I'm too far behind to reach my first $100. hope I get there sooner. 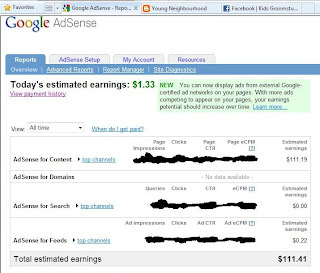 Congratz for the income generated from Google Adsense, Jason! Well done! Thanks for your support Rapideo. Mannoy, keep up your efforts. Soon you will be there too. Cheers! Thanks Horlic, still got lots to learn from you. especially on properties. great post case, i like it, i hope you can get more money from Adsense.keep in touch,if you have time,plz visit my blog and follow me back. thanks a lot! 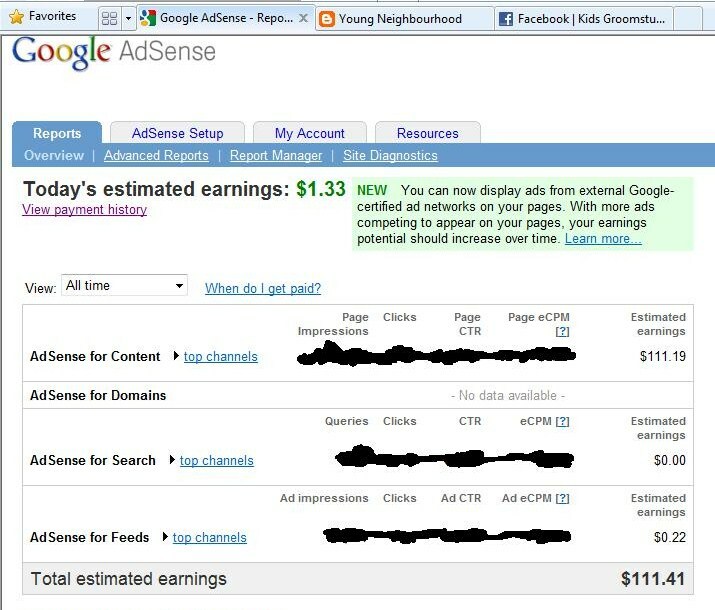 Adsense is my main contributor for now. Amazon is also a great way to earn money online. My Amazon earnings is catching up with my Adsense earnings. Thanks for dropping by, shuyu. It's my pleasure, bujju. I am so happy when I got my first payout from Adsense. I used the Western Union. It's so easy and quick. Thanks for sharing. I am in the same situation, where I do not get a lot of traffic, but was recently introduced to Hubpages. I haven't written any articles as yet, but now feel optimistic that that will change. Mark, start writing in HubPages and be patient. Keep writing. Your efforts will pay off. I have a few referrals who have just written 2 to 3 hubs and expect money to flow in. Unless in extreme lucky situation, it will not happen. I have written well over 10 hubs before seeing results. Good Luck to you my friend. Thanks for the encouragement SMSJmate. H2A, glad that you came by my blog. Cheers. Wow,,, glad to hear it for you! i have also a hubpage account but im still new so i cant see any progress to my google adsense. nevertheless, i still hopeful! You've done a great job with your blog! You deserve every success there is on your way. Keep up the good job! Great! i use this methods for my blogs by the way is it Submitexpress free service or not? Submitting your URL via Submit Express is free. They also have other SEO services which are NOT free. I suggest you use what's free only. Once you are more seasoned then you can decide whether to use their paid service or not.